In this current culture of divisiveness, stress, worry, and uncertainty what is your rock in a time of uncertainty? Principles. For many of us, these Principles provide a rock in times of uncertainty. Here is a Facebook post by one of our members, Becky Trombly-Freytag who has given us permission to share. What Becky did was difficult and was consistent with her values and our Unitarian Universalist Principles. She was courageous. And she did not have any regrets because she spoke up. She could not predict the effect of her intervention, but she certainly had a different experience in that store than she had expected to have when she went in. 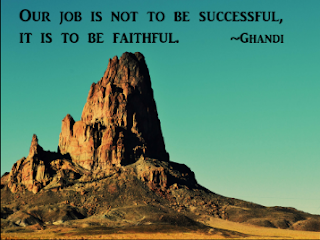 Ghandi wrote: “Our [job] is not to be successful, it is to be faithful.” How do you feel when you act or intervene in the world, based your personal values or your Unitarian Universalist Principles? 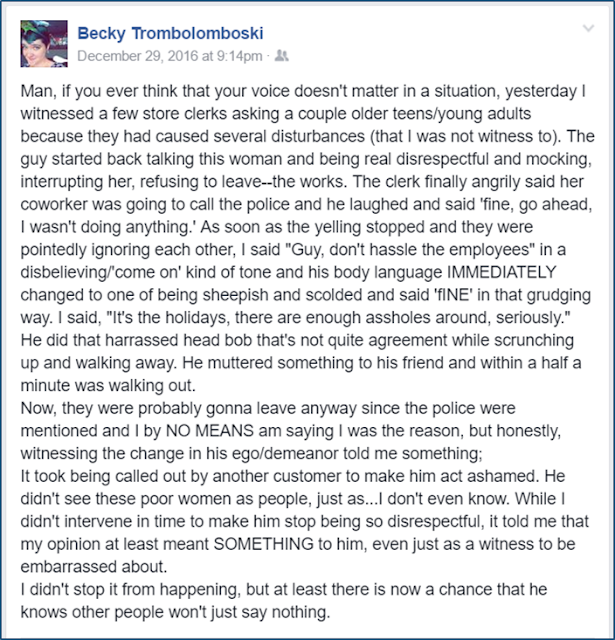 Sometimes, as happened for Becky, we get immediate evidence that our actions made a positive difference. But lots of times, we don't. Lots of times, many of us have no ideas if our actions have any kind of meaningful impact on situations. This week I attended an all-day workshop at Meadville/Lombard Theological School (one of this country's two Unitarian Universalist seminaries) called The Tilt to Global Authoritarianism: Religious Leadership and Shifting Power. There were a number of presentations, but two that were particularly impactful to me were We Who Defy Hate and Shaping History. “My friends, do not lose heart. We were made for these times.” I have heard from so many recently who are deeply and properly bewildered. They are concerned about the state of affairs in our world now. Ours is a time of almost daily astonishment and often righteous rage over the latest degradations of what matters most to civilized, visionary people. You are right in your assessments. The luster and hubris some have aspired to while endorsing acts so heinous against children, elders, everyday people, the poor, the unguarded, the helpless, is breathtaking. Yet, I urge you, ask you, gentle you, to please not spend your spirit dry by bewailing these difficult times. Especially do not lose hope. Most particularly because, the fact is that we were made for these times. Yes. For years, we have been learning, practicing, been in training for and just waiting to meet on this exact plain of engagement. Becky showed her soul. I stand firm in my belief that many of us have also showed our souls. I have seen a lot of memes lately about not normalizing the incoming administration. 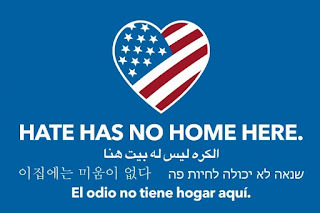 And while I understand where that is coming from, I say let us not throw rocks at the incoming administration, instead let us resist normalizing racism, bullying, misogyny, anti-Semitism, xenophobia. 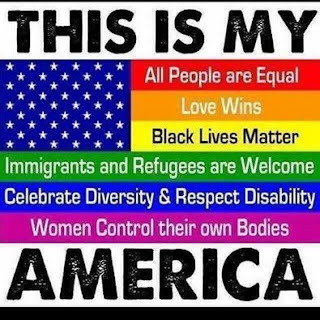 And let us resist any destructive policies are put forth that damage our planet, our public school system, or roll back the rights that many us have worked so hard to achieve—we will confront them, and by doing so I believe we will make a positive difference in our country. While we are dealing with these destructive behaviors, policies, and laws, we need to acknowledge that our old normal is gone. We will have to find a way to embrace the possibilities of this moment. We must breathe in hope and breathe out cynicism; we must breathe in love and breathe out suspicion; we must breathe in power and breathe out fear. My friends we will have an impact on creating the new normal of the future. We must remind each other that we are prepared for this time. We have been saying our mission each week during worship: We gather as an inclusive community to grow in character, mind, and spirit and to transform the world toward fairness, love, and compassion. We have created a thriving Social Justice Committee and are working on our Social Justice Initiative. We have been educating ourselves on many of the social justice issues that our country faces through presentations in this church, through book clubs and through our own personal study. Friends, we haven't spent the last three years, or for that matter the last sixty years that this church has existed, being disconnected from the world out there. We have spent this time equipping ourselves for what we are now facing. 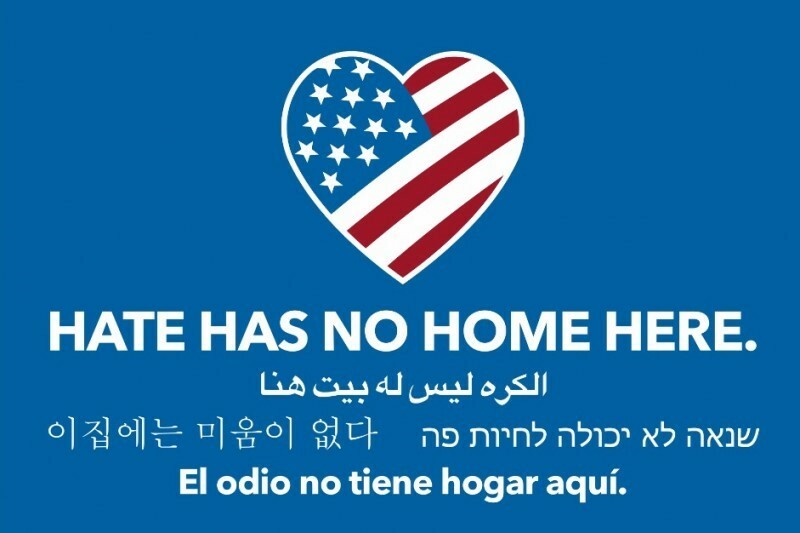 Your acts of courage, putting rainbow flags on your houses, rallying for Reproductive Justice in front of Planned Parenthood, writing letters to the editor or to our elected leaders, standing with our black, Islamic and Sikh brothers and sisters in time of need, lobbying for LGBTQIA rights, in particular marital rights, lobbying for Green jobs, putting up yard signs declaring sanctuary for immigrants, all of these acts and more are ways you are standing up and showing your soul. Our Principles are not creeds, but they are a description of the values that most of us hold true in our heart of hearts; they are the values that we hear singing from the still small voice within us, as well from the voices of young and old in this church. They are our guides in the work we are called to do right now. in every act of unity. I will continue to affirm and promote them to keep them at the forefront of our hearts and minds and I will continue to live them. 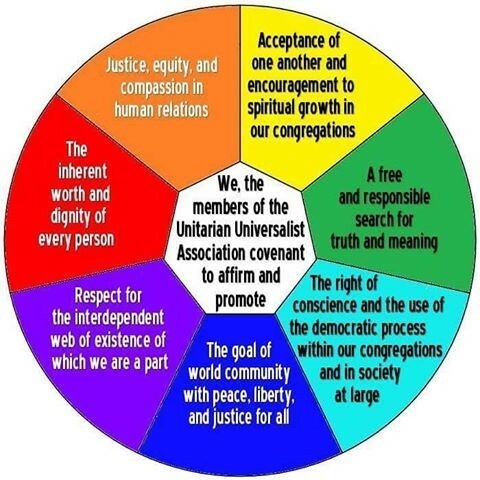 As Unitarian Universalist minister, Reverend Tom Schade reminds us: “The seven Principles describe our vision of the Beloved Community, both in our congregations and in the world at large…...we have learned that the obstacles to the Beloved Community [that] the Principles envision are the systems of oppression that rule our world…We learned that to live in the world imagined by our Principles, we [have] to root out and dismantle systemic injustices.” Our Principles and our values ground us in this work. And let us never forget that we Unitarian Universalists are not alone in dismantling injustices. Other faith communities may have different beliefs, principles, and reasons to do this work, but they are still called just as we are to this resistance. Each of us standing side by side, each of us holding on to our rocks, not to throw but to calm, to steady, to ground us. 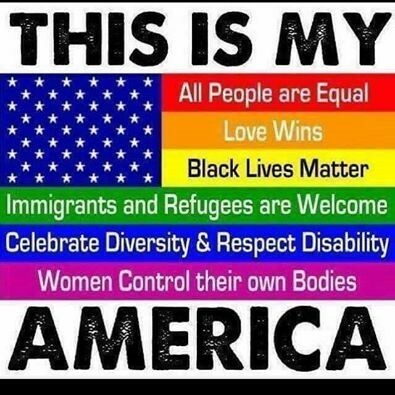 I offer these words by Unitarian Universalist minister, Reverend Lisa Friedman for us to reflect on: “We live in a fragmented world that tempts us to despair. We would put it back together, piece by piece, if it were ours to choose. But sometimes the fragments are enough. In a world of cruelty, there is still power in every act of kindness. In times of doubt, there is still power in every act of hope. In an age of division, there is still power in every act of unity. May we remember that sometimes the fragments of meaning we make are just the right size to hold in our hands.” Go forth spreading fragments of justice, equity, and compassion into the world, knowing that eventually these fragments will one day reach a critical mass, tipping our world toward an enduring good. With that hope, that faith, in our hearts for the work ahead of us, can I get an Amen. Really uplifting piece thanks tom I have been watching your sermons on tv I have also had an opportunity to meet you in person you are a really inspiring individual keep posting more articles. What is your rock in a time of uncertainty? By Reverend Tom Capo, the quote you have posted is super amazing and motivating at the same time. Thanks for sharing the post with us!